[PDF] The History of American Higher Education: Learning and Culture from the Founding to World War II | Free eBooks Download - EBOOKEE! Description: This book tells the compelling saga of American higher education from the founding of Harvard College in 1636 to the outbreak of World War II. 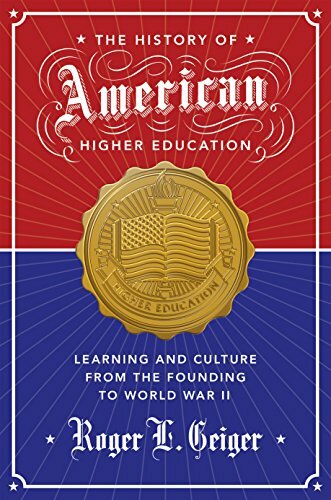 The most in-depth and authoritative history of the subject available, The History of American Higher Education traces how colleges and universities were shaped by the shifting influences of culture, the emergence of new career opportunities, and the unrelenting advancement of knowledge. Roger Geiger, arguably today's leading historian of American higher education, vividly describes how colonial colleges developed a unified yet diverse educational tradition capable of weathering the social upheaval of the Revolution as well as the evangelical fervor of the Second Great Awakening. He shows how the character of college education in different regions diverged significantly in the years leading up to the Civil War for example, the state universities of the antebellum South were dominated by the sons of planters and their culture and how higher education was later revolutionized by the land-grant movement, the growth of academic professionalism, and the transformation of campus life by students. By the beginning of the Second World War, the standard American university had taken shape, setting the stage for the postwar education boom. Breathtaking in scope and rich in narrative detail, The History of American Higher Education is the most comprehensive single-volume history of the origins and development of American higher education. No comments for "[PDF] The History of American Higher Education: Learning and Culture from the Founding to World War II".